The excitement in the air was evident as women, men, young adults and children entered the Dunkin Donuts Center last Thursday evening. Who could bring so many walks of life together? A hip-hop artist, Disney on Ice, George Clooney? Better that that — much, much better. The youngest Nobel Peace Prize recipient, Malala Yousafzai, came to the Dunkin Donuts Center, in an exclusive Northeast appearance. Malala’s story is one of true grit, perseverance and courage. 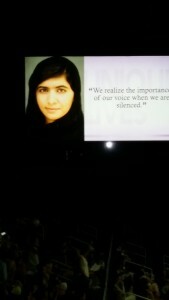 I have been so moved by her story that as an educator I find a reason to bring up Malala’s story in my English classes. Four years ago when Malala was 15, two men boarded a bus and shot her and her two friends. Her injuries were severe, and the world rallied around her. She credits that to her recovery. The evening began with Patrice Wood from WJAR 10 taking the stage to introduce a chorus from Massachusetts, the choral director of which had written a song for Malala. As the chorus filed in, Malala and her father entered. Few people on this Earth can invoke the emotion in the room when we as 6,000 strong stood up to give them a standing ovation. The format was what you would expect for a Q&A. Malala spoke and then settled in for questions generated by attendees. And although she has a Nobel Peace Prize, has met dignitaries, and has changed the conversation about education, she is still a young adult. The conversation quickly turned light-hearted as she admitted her dismay that her father could not grasp Pokemon, and that one of her first experiences in our capitol city was a fantastic meal at India followed by a walk in the park, where they ran into Pokemon Go players, and her dad kept trying to understand it by asking strangers to explain it. When the conversation turns to her family, she is quick to joke about her brothers, and insist that everything at home is normal, even when she needs to pick up her room. Many of the questions were submitted through social media, and Patrice Wood did a lovely job switching back and forth between her questions and those from the public. Questions ranged from whether Malala would consider attending college in Rhode Island (she said it’s so lovely you don’t want to leave), to what her father did to encourage her (more on that later). One notable point in the evening, and believe me there were many, was a question disparaging people who work in blue collar jobs, specifically in factories. She was quick to point out that a factory job is a good job, and that as society we need all types of jobs filled. She expressed how dismayed she is that we still throw jobs in categories. She speaks as a woman far wiser beyond her years, and of course given what she has gone through, she is. When the conversation turned to the topic of forgiveness, Malala noted that her attackers were brainwashed, that she forgave them and that forgiveness is the best revenge. Even with seemingly simple topics, Malala finds that silver lining. For example, when the conversation turned to Pokemon Go, she credited it with getting her brothers out of the house. Her love for her family is evident as she speaks of her parents in the highest esteem, and enjoys the public stage to rib her brothers. And there were endearing moments, like when Philadelphia’s Hilde Lysiak, a 9-year-old journalist, came on stage to ask Malala three questions, the last being whether she had a boyfriend. The pair shared a cute moment on stage as Malala told her if she gets one, she’ll tell Hilde in confidence. It is clear that Malala truly believes in her mission of empowering young women. As a teacher I keep going back to something she said before the Q&A. Her weapon was her voice. Her weapon was a book and pen. These are the lessons I know I will bring with me to the classroom this year and beyond.